The app mentioned in this post saved my sanity while opening drawings that contained a large amount of XREFs (External References). 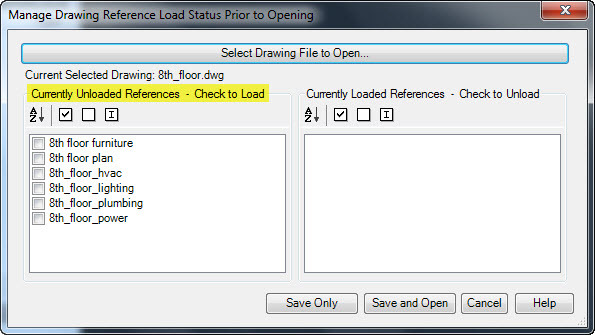 The “XREF Load Status” app is available from the Autodesk Exchange Apps store in a free version that will only work with XREFs that are .dwg files or a paid version that will work with XREFs that .dwg, .DGN and various image files. I spent the $5 for the full version since I knew that I would be dealing with various file types from time to time. I usually don’t do a review like this but this app needs deserves it. The app is made by RedTransit Consultants. They have other apps available and also services to develop custom apps as well. The project that I used this app on had a ridiculous amount of XREFs some of which were huge. Some files referenced over 140 other files and the disk size was well over 350 megabytes and it took multiple minutes to open. And the thing is that maybe the only edit that was needed to be made was a text edit or Attribute edit. That’s where this app came in to save the day. 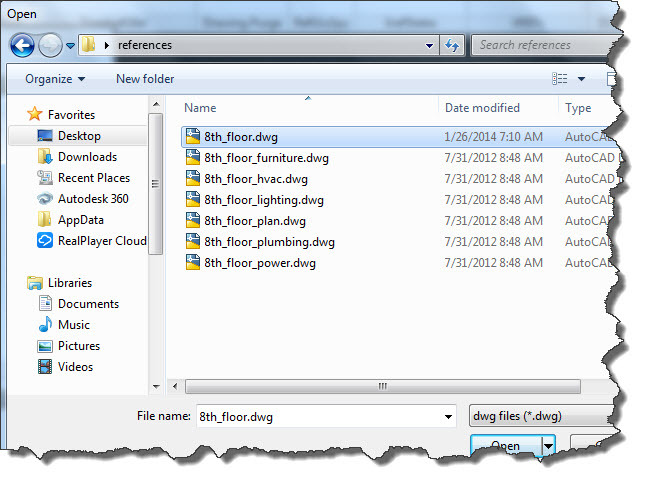 After installing the XREF Load Status APP, it should appear under the “Plugins” tab of the ribbon. Click to start. 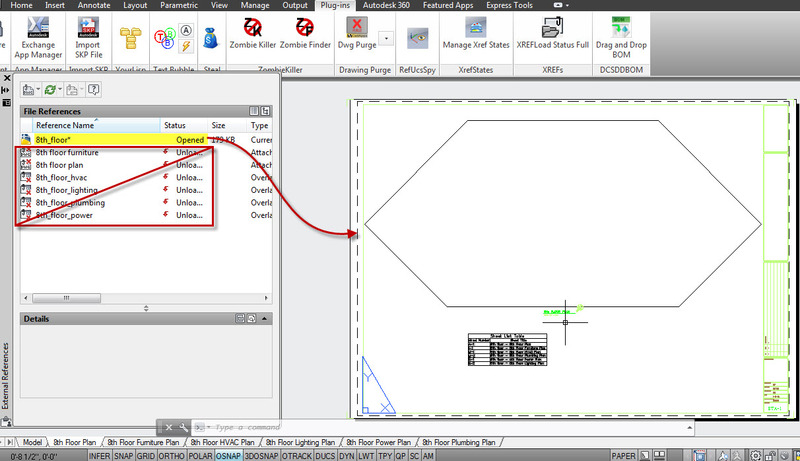 Once the tool starts, you will see the dialog box shown below. 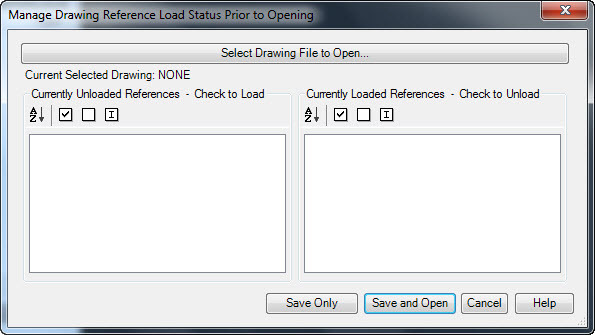 The drawing’s XREFs will display in the dialog box and the various option of how the XREFs are loaded will be shown. Invert All Toggles – Will let you easily switch the checks in the check-boxes. This is great becasue otherwise you would have to use the select all button and then go through and deselect the XREFs that you want loaded. So – to use this option, you go through the list of XREFs and check the ones that you want loaded and then click this button to “invert” those selections. Once you have made your selections, you are given the choice of what to do with these changes, You can simply save these setting in that file without opening it and move on to the next one, or you can apply these settings and open the file. 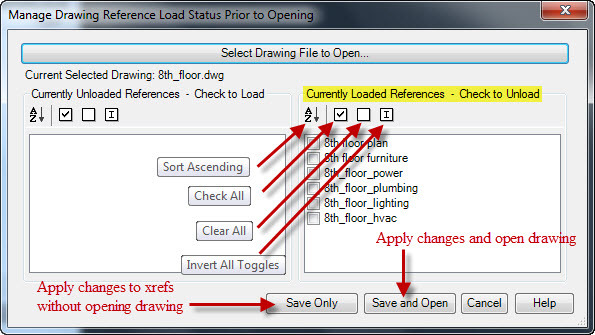 The drawing shown below is the file with all of the XREFs not being loaded upon opening. This entry was posted in Customization, XREFs. Bookmark the permalink.